Strange products exist and sometimes you can't help but think: "Who needs such a thing?" 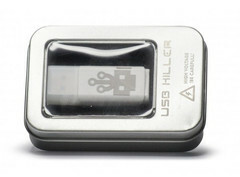 "USB Killer" is such a product: It looks just like any other USB stick. But plug it into a device and it will start to charge with a voltage of around 200 Volt and release the voltage into the USB port. This cycle is repeated many times per second until the stick is plugged out. As many devices are not properly protected against overvoltage from a USB port, the notebook, PC, tablet, Smart TV or whatever the USB Killer was plugged into, will be severly damaged or even destroyed. At least, there is a "Test Shield" that you can put between the "USB Killer" and the device. It allows you to test the stick without having to fear for your device. Who would want such a product? Manufacturers maybe, who wish to test whether their devices are properly protected against overvoltage. Plus you can use it to destroy your device on purpose if need be. Of course, you can also use "USB Killer" for all kinds of not-so-funny mischief: Destroy the new MacBook Air of your dearest foe or stop your husband from watching TV all the time by simply rendering your Smart TV useless. Interest seems to be high: At the moment, there are no "USB Killers" in stock.